PR, Social and Event Management. We are a full-service communications agency that gets results. Polkadot Communications offers a breadth of services that fall under the communications umbrella. 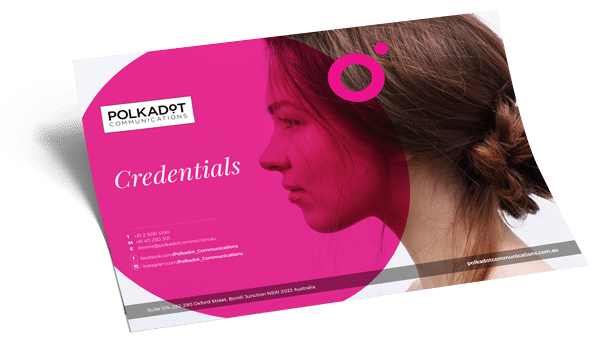 Whether you’re after a bespoke PR Agency, a Communications Agency, a Social Media Agency, an SEO Agency, an Event Management Agency – Polkadot Communications is a one-stop-shop consultancy that tailors the marketing strategy to the individual client’s needs. We go through an effective process with each client to identify their objectives, understand their industry and the future of the brand so that we can prepare a strategic communications plan to suit their needs. Outcomes include an increased brand awareness and sales, and ultimately the growth of the client’s business. No matter what your communications needs, Polkadot Communications will work with you to execute a well thought through program to meet your objectives, no matter how big or small. Are you looking to accelerate your business growth? Do you want to get up and running ASAP? Then don’t start reinventing the wheel! Subscribe to our newsletter for updates and take a look at our free marketing resources to learn how to grow your brand and get started quickly. For maximum impact, we combine the communications services our clients need to get results. Would you like to see how your competitors are performing? Understand what the media are publishing in relation to your industry sector? And see how Polkadot Communications has helped its clients become famous? If you answered 'yes' to any of those questions, then take a look at our credentials to get the answers you're looking for. We use our full arsenal of explosive communications skills to make all of our clients' brands bigger than ever before. Here are just some of the brands we've made famous over the last 11 years. Would you like to know what our Director and communications expert, Dionne Taylor, thinks about your brand and if strategic communications could grow your business? Let's take the first step together and book a free 30-minute consultation. Connect with us on your favourite social network. See you there! Please fill out the quick form below and we will get back to you super fast.